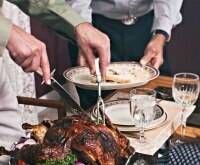 Thanksgiving isn’t just about platefuls of delicious food. You need the perfect setting to go with those plates, and it doesn’t have to be a big ordeal to create it. 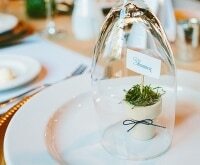 Little touches make all the difference, from centerpieces to place settings and napkin rings. 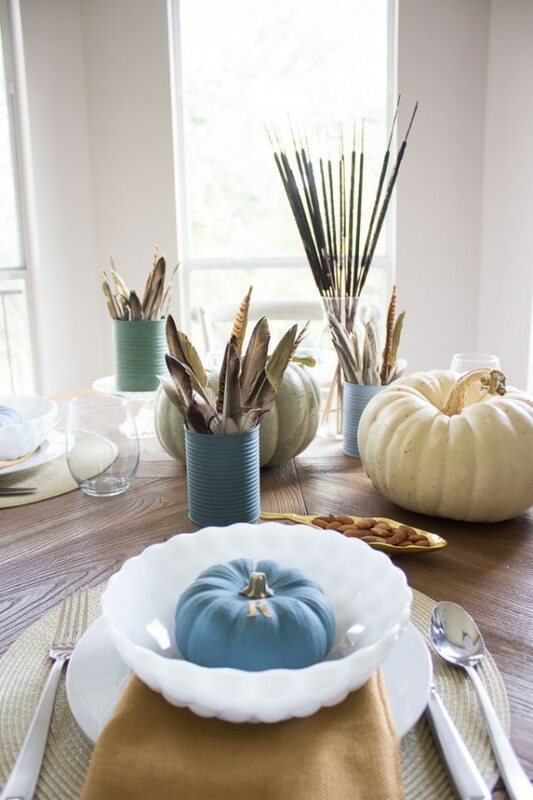 Pick one or a few of these Thanksgiving table décor ideas to spruce up your holiday feast, and check out even more DIY place settings here. 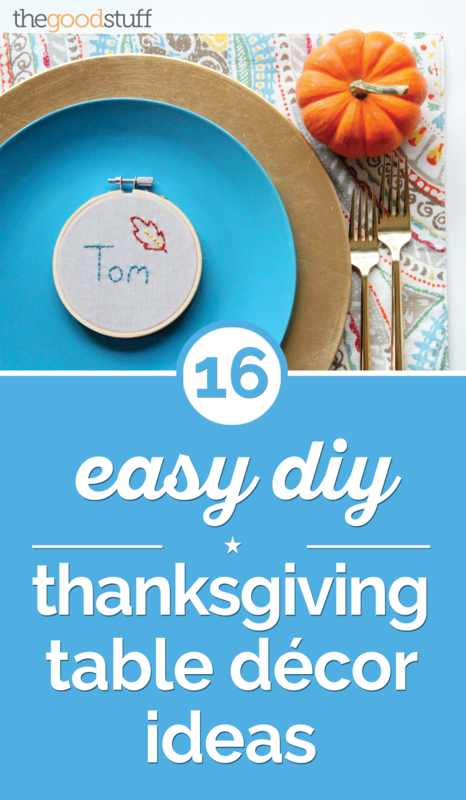 Are you looking for more Thanksgiving DIY ideas? 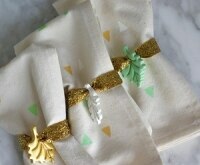 Check out these festive napkin rings and easy-to-make Thanksgiving decor you can spread across your entire home! These cute stitched place settings can be taken home as souvenirs at the end of the night. 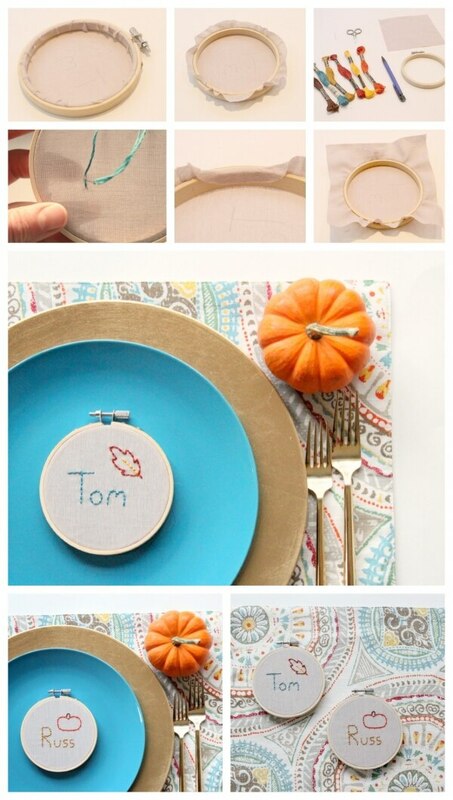 Have fun picking different motifs to go with each name, and match the thread colors to your table decor. Cut a piece of fabric into a 6-inch square. On the back side of your fabric, write out a name and simple motif to stitch. Make sure your drawing is in reverse so it will be correctly oriented in the front. Stretch the fabric into the hoop, centering the name and drawing. Trim away extra fabric so there’s about a 1/4 inch left. Run a bit of hot glue along the inside edge of the hoop and wrap the extra fabric around it. Cut a piece of embroidery thread to about 6 inches and tie a knot at the end. Stitch along the line, forming a solid line of thread. If your fabric is light like the one shown, you’ll want to cut and rethread between each letter and motif so you don’t see a line of thread. Finish stitching the name and motif, and you’re done! 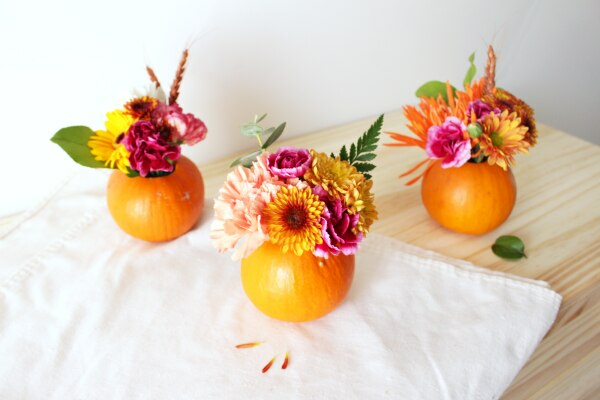 These stunning floral pumpkins will add the perfect pop of color to your table. To make, stick a shot glass full of flowers into a hollowed out mini pumpkin. 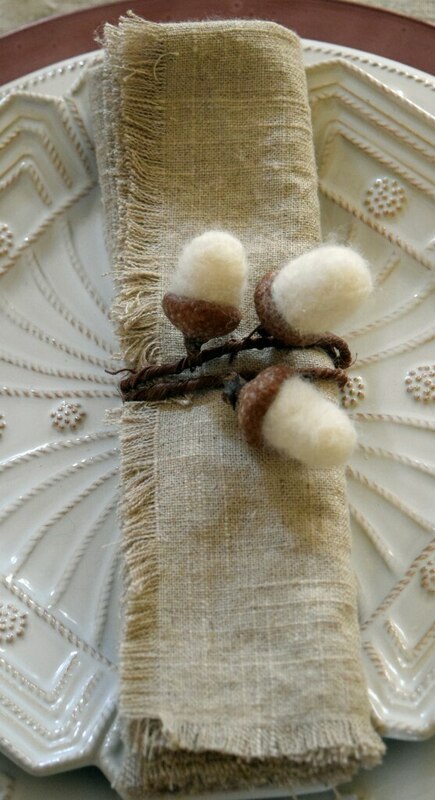 These charming little acorns are easy to make out of wool roving, and when you wrap them around a piece of rustic wire, they make an adorable napkin ring. Stick with classic white or make them colorful. Add a pretty pop of color and pattern that matches your chosen table setting. 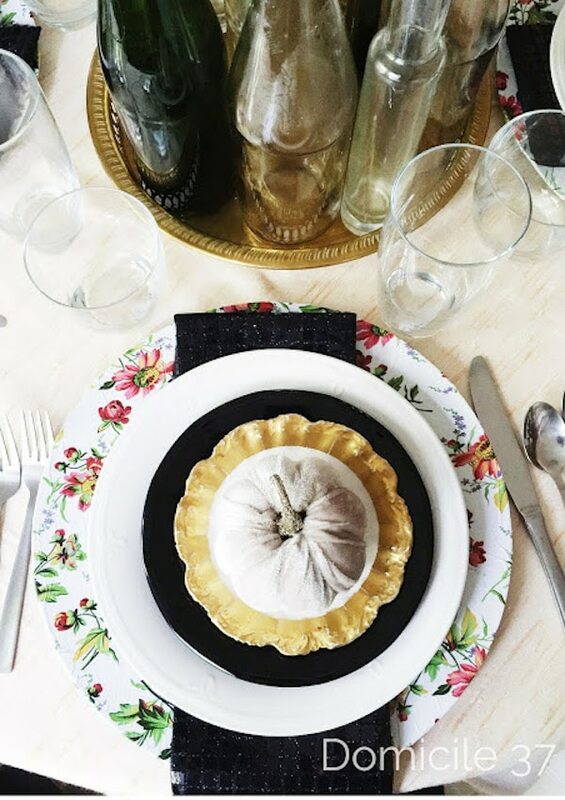 Simply cover a cheap plastic plate charger with wrapping paper using Mod Podge. 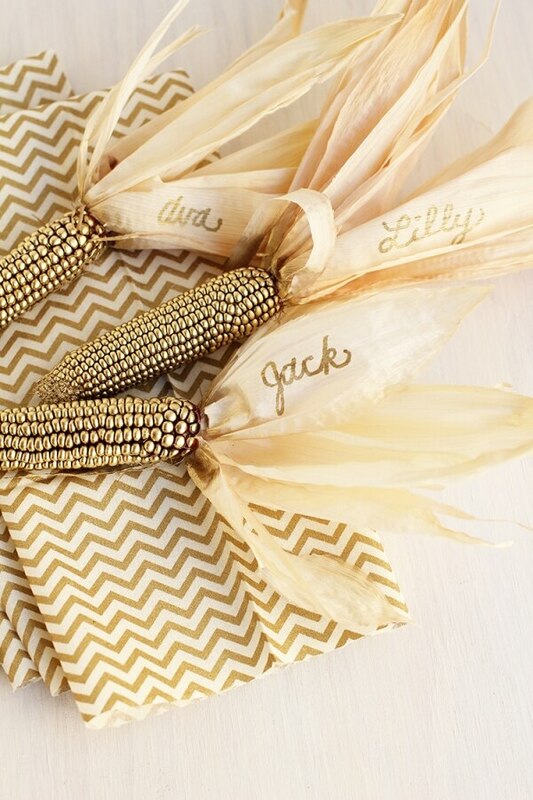 All you need for these snazzy place settings is miniature Indian corn, gold spray paint, and a gold paint pen. You’ll show guests to their seat and fancify your table at the same time. 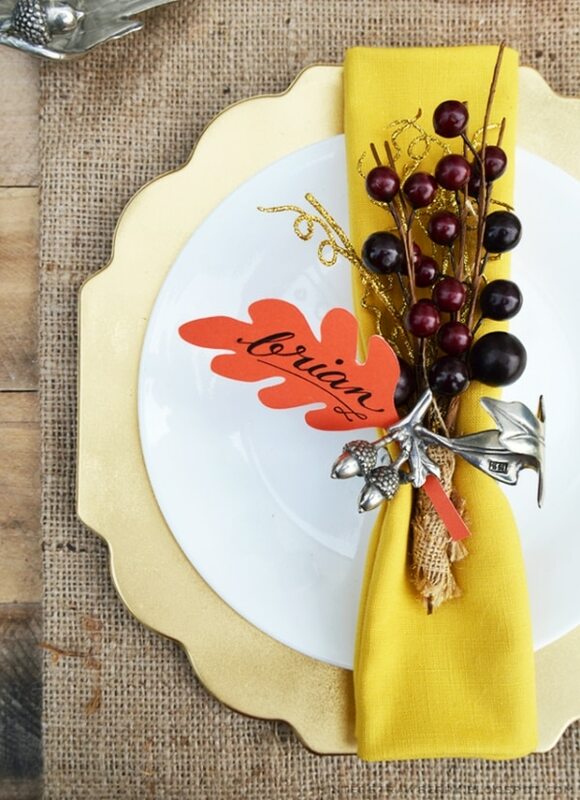 Accentuate each place setting with a charming autumn bundle. 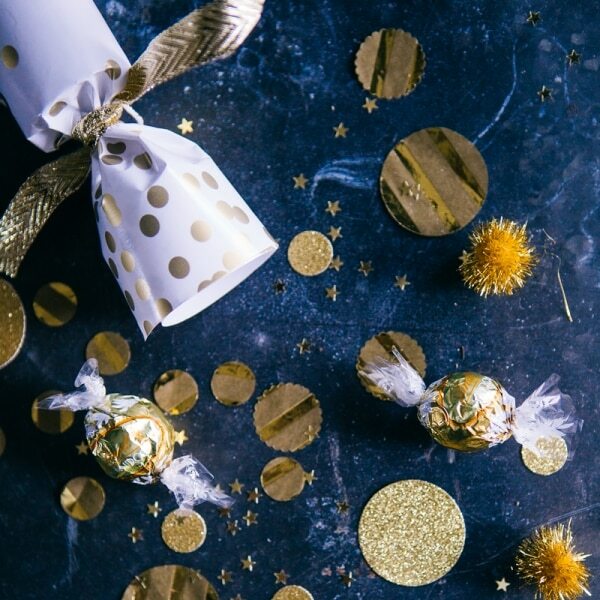 Just wrap berries, decorative gold sprigs, and burlap together. 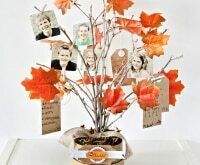 Finish it off with a leaf place card for the full fall effect. 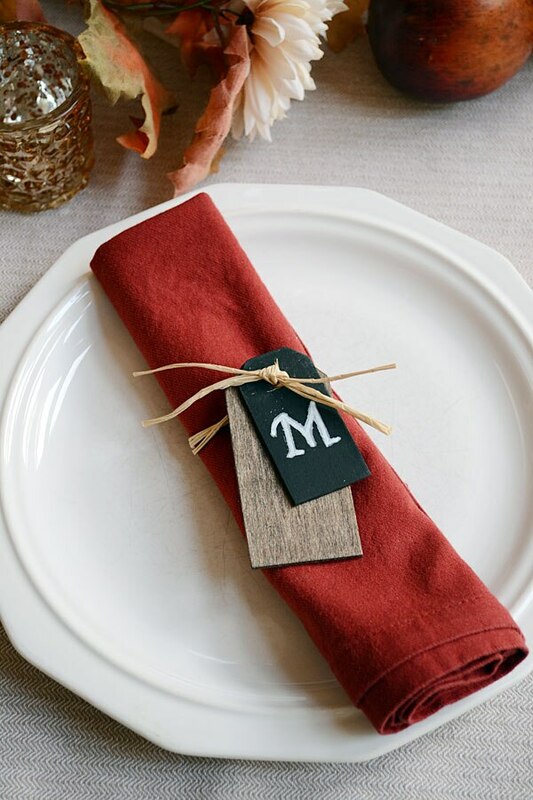 These simple monogram napkin rings add an elegant custom touch to your table. To make, paint wooden nametags with chalkboard paint and write on initials. Why not go bright this Thanksgiving? 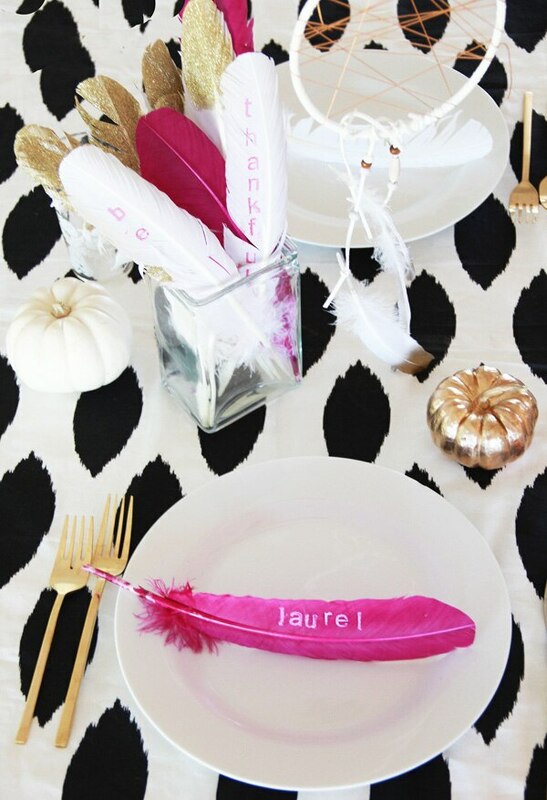 Jazz up your table with colorful stamped feather place settings for an unexpected spin on autumn decor. 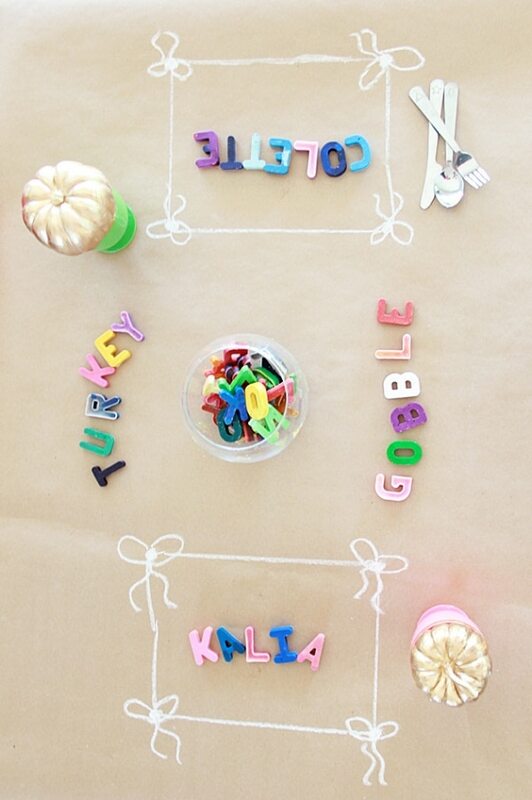 This is a brilliant and adorable idea for the kids’ table. Crayon letters, made by melting crayon pieces in silicone alphabet molds, will keep them occupied and entertained. These cards will help you get into the true holiday spirit, and the free printable makes them a breeze. 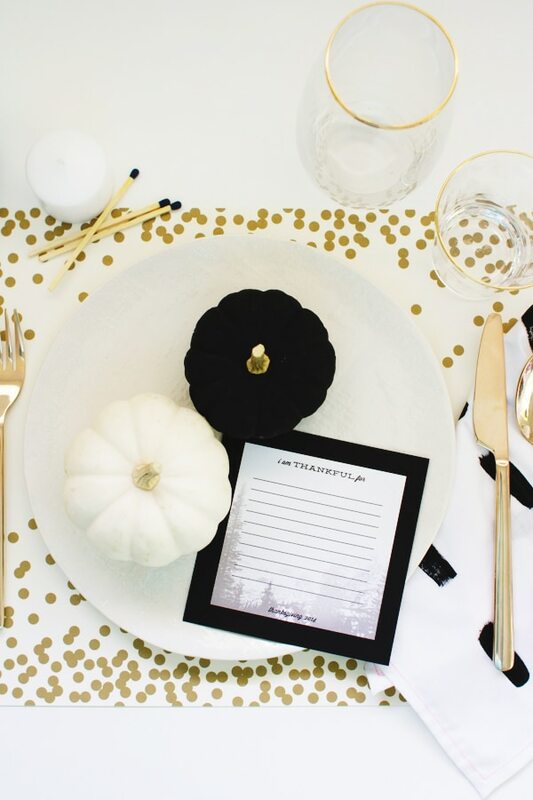 Have guests write down a few things they’re most thankful for as a way to spread positive vibes at the table. The black, white, and gold palette is also something to smile about. 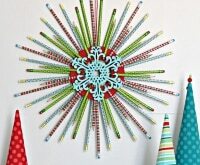 Don’t wait until Christmas or New Year’s to pop the party crackers! 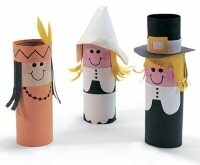 Make them for your Thanksgiving table out of paper towel rolls and fill them with whatever goodies you like. Cover them in wrapping paper that matches your table decor. This simply stylish table is brought together by pretty painted accents in shades of blue and green. Paint aluminum cans to use as vases for feather bouquets, and paint mini pumpkin place cards finished off with a gold sticker initial. 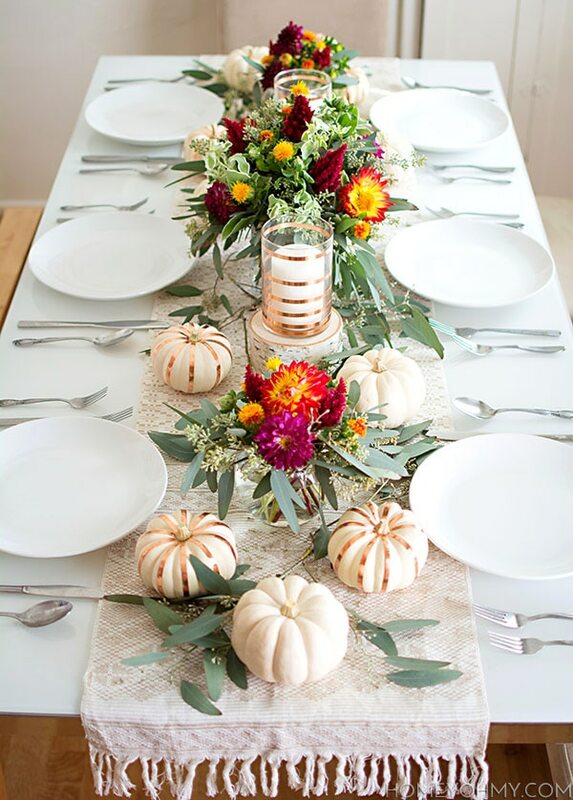 This floral fall tablescape gets the perfect touch of shimmer from copper wrapped pumpkins and candle votives. White dinnerware and bundles of bright flowers are the perfect backdrop. 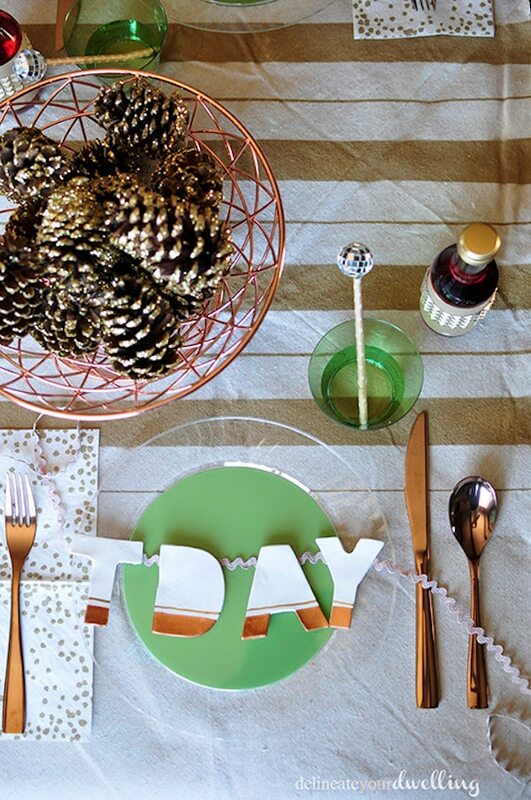 Set a cozy and casual vibe with decorated disposable dishware — these green plates are just painted plastic! 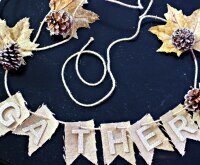 Make a runner out of a dropcloth and paint, and a fun T-Day banner is the perfect finishing touch. 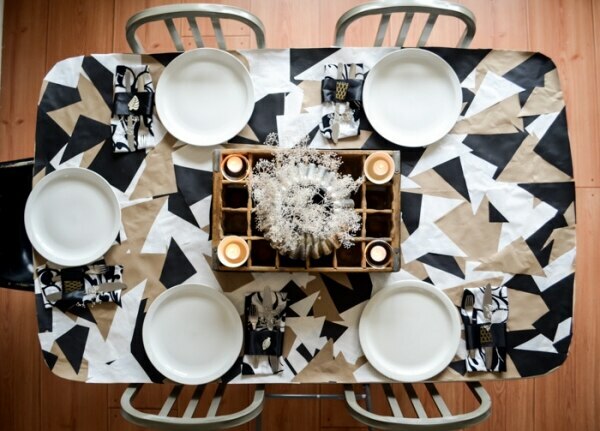 This eye-catching tablecloth looks cool and makes cleanup easier! This one is made out of brown shipping paper, vintage wallpaper, cardstock, and calligraphy paper. It just requires some cutting and gluing. 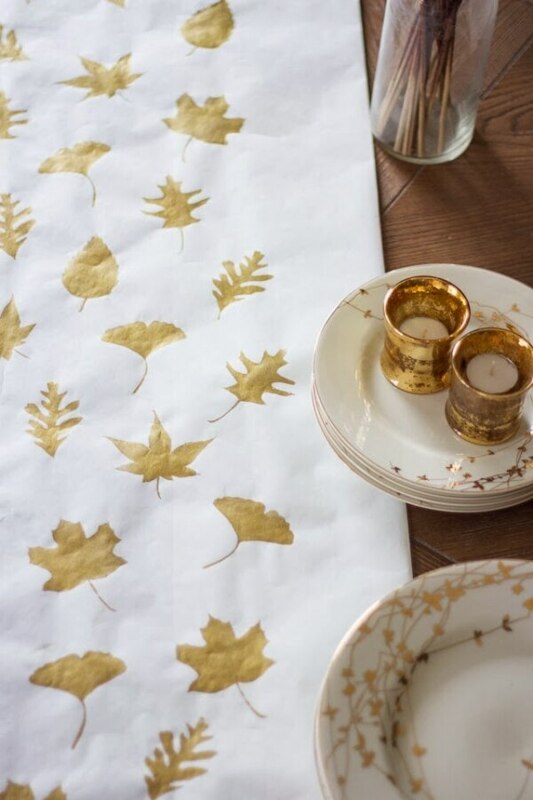 A table runner is a quick and easy way to add some character to your table, and looks elegant when done in white and gold. Leaves are a classic fall motif but you could pick an abstract design or other autumn imagery as well. 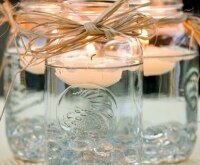 You’ll be busy enough in the kitchen on Turkey Day, so make table decor a simple and fun activity to do in the days ahead. 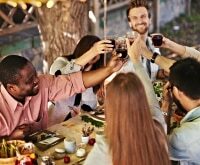 A relaxed and handmade setting, from personalized place settings and unique table decor, will make the food taste even better.